Welcome to the second of three tutorials where we look at making a few changes to our Research Binders in order to make them a bit more reader-friendly. I’ve got a some information following the tutorial in case you find that you have any questions. Hopefully, I’ve addressed them all but feel free to send other related questions my way! If you haven’t seen the first tutorial in this series, you might want to read through that as well since I address a lot of basic information that you might not see in this second tutorial like background papers and using Picasa tools. As I have explained in the first video, I am showing you the changes that I have made to my own personal family history research binder. I love the digital scrapbook papers that I have used. If you see some that catch your eye, you can find out where I got them at the bottom of this tutorial! While working with clients for almost ten years, I have given back many a research binder filled with lots of wonderful documents detailing the lives of their ancestors. When I hand over those binders, one of the first things that I usually suggest is that they add family photos to the album to bring it to life. Today, I’m suggesting that we can take a couple more steps that might result in the binders actually being looked at by family. The idea that your research binders won’t be enjoyed without sprucing them up doesn’t apply to everyone. This is just a trend that I have seen over quite a few years and a large majority of clients! They either do all the work themselves or have hired it done only to find out that no one in their family seems to care. To their family member’s credit, I also know that family history is something that we all have to be in the right place and time to want to become involved. — I’m suggesting that we can nudge things along if we try a few things within our binders. In my first tutorial I ended with the thought that we would all “love to lure our younger family members into looking at their family history and taking an interest.” Well, if you have ever watched the younger family members scanning their phone “feeds” of Instagram or FaceBook or whatever app they are fond of, you will quickly see that what gets their attention has to have something that draws them into the story or picture. 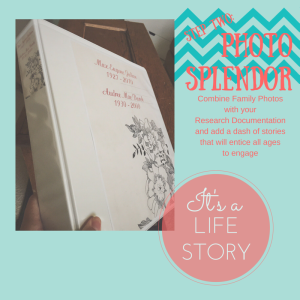 I’m not suggesting that we need to change our book solely for the younger family members, but that we can reach more generations if we combine those valuable documents with photos and stories – kind of tying it all together into an easy-to-digest format. Of course, there is always a little ground work to do before heading into any project and this one is no different. We need to have stories before we can incorporate them into our research binders. As you are pulling together the photos that you want to add to your binder, I suggest that you take copies of those pictures and make a few visits to family members that either knew the people in the photos or were actually in the photos themselves. Then I would prepare to make some notes as they reminisce about the event that was happening or something in particular that sparked a memory. It is these little bits of stories that make such an impact when adding it to your family history binder. While I have your attention, I’d also suggest that you take this opportunity to get a video or audio record of your interview. Then I would save those clips to be enjoyed at a later time and possibly even added to a digital version of your binder. (Just thinking ahead!) It also helps to be able to listen again and catch everything that was mentioned without having to stop the flow of the story as it is being told. Lastly, I suggest that you go ahead and leave the copies of the pictures you have been looking at with the family member as a thank-you. Of course, if you send them a copy of your finished page that includes their story, that would be even better! No Pics? No Problem — but Time is Wasting. If this is where you are lacking, then again, I would make a point to contact all the family members you can get to and see when you might visit them. Take along your smart phone and an app like “Heirloom” to scan the pictures. If you don’t have to take the photos out of their sight, it is more likely they will relax and then you can proceed with listening to their stories. Don’t be surprised if you don’t leave them with a real good feeling – talking with your family about their past makes them feel important as well as loved. A win-win situation in my mind! I’ve said it before, but most of the older family members that I interviewed several years ago have all passed. If I hadn’t taken the time, I would have missed out on all their stories. Lesson learned the hard way. Organization strategy – Who Needs It? That title is laughable, I know. Once you start to collect any family documentation, stories, and or pictures, you quickly find out that you will need some type of organization. It can get crazy real quick. These are all simply suggestions and obviously they are based on a more recent generation – in fact these are the same titles that I used with my father’s folder. Just take a few minutes to jot down some ideas of what you think might work and then look through your binder to verify that it all makes sense. There is nothing worse than starting to organize things and quickly realizing that it just doesn’t work! Once you are set with the format, then you can begin to scan the documents you have already located or download them directly into the folder that they belong. There are a lot of organizational plans for family research, but if you are going to try and tie them together for a presentation, this works well for me. I can have a visual idea of everything that I want to include in the binder and it is easy to pick and choose what I need! Picasa – Love for Photos but Definitely Not a Word Processor. Did I mention it’s FREE? As long as we all go into this project with the idea that we are going to keep costs to a minimum – FREE, then we can come to terms with the limitations that we will encounter. Picasa is a very user-friendly photo editor and photo management software. I’ve been using it for years even though I also have Lightroom and PhotoShop. It’s quick and easy to move around in and you don’t have to take a refresher course everytime you want to use it! By the way, I also have PhotoShop Elements and it is an excellent bridge product between Picasa and the full-blown Photoshop, but my focus with this tutorial was on FREE and EASY. So, when you are preparing to tie the photos together with stories and documentation, you will want to have an idea of exactly what you want to get across with each page. In the page that I’m demonstrating with this tutorial, I am enlarging a section of a 1940 census so that I can see what was entered for my family. In my description of the census, I will explain the column entries and if I have any background information, I will add that in as well. All the stories for that one page can be kept in one document for easy retrieval and then saved in the appropriate folder as well. As I’m working in Picasa, I can then simply copy and paste (Control-V) into Picasa. This might take a bit of trial and error but it is really worth it and you will quickly get an idea of how much you can add to get the desired effect. You might need to adjust the size of type if you want to add more to a line. The important point here is that you will want to manually add RETURNS into your text so that it will pick up on the returns when it gets pasted into Picasa. Otherwise, it will become one long line of text and you will need to place the returns manually within Picasa. I think you will agree that doing it ahead of time is a good thing! You can always adjust the end of a line by deleting the <return> and adding it back at a different spot, but experiment first. One other thought: When you paste your text in Picasa, it will be huge and you will need to shrink it down. That works for me, but it might take some getting used to when you are starting out! I never know if anything I ever post will help anyone. But I can sincerely see the difference it has made in my own family history research binders and I am hoping that it might prove helpful to someone else. You might choose a different path to change up your binder, and I’m OK with that. I’d love to hear about the changes you have made and what has worked. And if you have taken it to a family get-together and have some reviews on how well the change-ups worked, I’d love to hear about that as well! Our Family Research Binders need to be brought out of their closets! Let’s get them to the point that they see lots of light and are enjoyed by even more family members.